Having a “remember me” function is a very useful feature, and implementation with React and Express is relatively easy. Continuing from our last part where we set up a WebRTC chat application, we will now add Mongo-backed persistent sessions and a database-backed online user list for good measure. If you have not used sessions before, in brief they are pretty similar to cookies, in that sessions enable you to track the active users of your application in real time. Sessions actually work via a session cookie, which is sent in the request / response headers from your app. So cookies and sessions are intertwined by nature. Then why do we need sessions if we already have cookies? What sessions give you in addition is the ability to define the back-end storage used by the server part of your application. This means that whenever the information is required by your app, it can be retrieved from the database. So in a real-life example for our chat application, we can now store the username of the user—and if we reconfigured our app somewhat, also insert the entire chat history into the database for logging. In this next example we will use a Mongo database for persistent back-end storage. This is one of several options available for session storage, and another I highly recommend for larger-scale production setups with multiple web servers is memcache. As the name says, NoSQL doesn’t use SQL to perform queries. Instead the data is abstracted with method calls; for example db.collectionName.find() would be a SELECT * FROM table. Terminology is different: in MySQL we have Tables, Rows and Columns, and in Mongo it’s Collections, Documents and Keys. Data is structured, the same as a JSON object. Now let’s add some Mongo to our app. Fire up your code editor, and open app.js and set the top of your script to be as follows. We include mongoose with require('mongoose') and then utilise our database connection via mongoose.connect('mongodb://localhost:27017/chat');. The /chat defines the name of the database we are connecting to. Next, for development purposes, I recommend we set the debugging to on. The way that mongoose is used is that once the db instance receives the open event, we will enter into execution for our mongo connection. So we will need to wrap our existing code into this new mongo connection in order to utilise it. Here is a full code listing with mongoose added and inserting rows and deleting them as users come online and go offline. To see this working, let’s fire up the chat application. Just run npm start to get ‘er up. Now connect to the chat as normal inside the browser (default at http://localhost:3001). Once you have connected to your chat, in a new terminal window open mongo chat to enter the mongo cli. Here you have the document record stored inside your mongo, and now you can always check how many users are online by running at the mongo prompt db.users.count(). Because we used Express to build our application, this part is really pretty simple and just requires the installation of a couple modules from npm to get us going. After you set up mongoose.connect you can configure sessions with express. Change your code to the following; you can specify your own secret string. Here a crucial setting to note is the saveUninitialized: true inside the last app.use. This will ensure the sessions are saved. 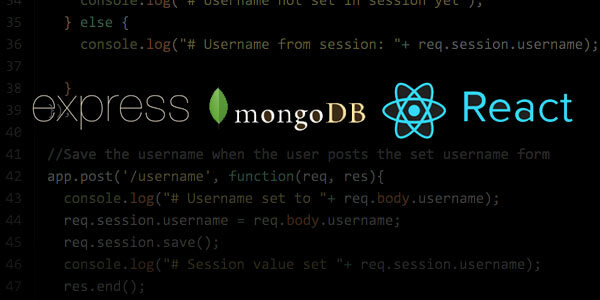 We specify where with the store property, which we set to the MongoStore instance, specifying which connection to use via mongooseConnection and our db object. This will create the req.session.username variable with the value being entered by the user and save it for later. Next, we can check for this value with our client-side code and automatically log the user in when they refresh so that they never get signed out of the chat and are automatically logged in as their chosen username. Also interesting to note, because we have database-backed sessions, is that in the event of the developers changing the application and the back-end reloading, the users logged in to their clients will stay logged in as the session store is now persistent. This is a great feature to keep your users happy and logged in all the while you are developing, or if there’s a disconnection from an unstable client. Now that we have the session cookie part set up, let’s work on adding persistent login to our front-end code. So far we have just used the default route provided by Express for an SPA application, and not defined any route handling for Express. As I mentioned before, to get access to the session you will need Express’s request / response variables. With the $.ajax facility of jQuery we create a request to check the value of the session variable when the document becomes available. If it is set, we then initialise our React component with the stored value, resulting in an autologin feature for our users. Fire up the chat again with npm start and have a look in your browser to see the sessions working. Now you have seen how easy it is to use Mongoose in conjunction with Express and set up Express sessions. Taking your application development further with React as the view controller linked to database-backed elements will create some serious applications. If you want to go a step further with React and look at how your components can communicate with one another internally inside the React framework, this guide from the official documentation is very useful.